The default job assignment for a volume machining operation is the <Current part>. The same item can be also added to the job assignment by pressing the <Reference> button. As one can see from the name of the item, all the faces of the part will be machined. If only several faces have to be machined those should be added to the job assignment explicitly by pressing the <Add Faces> button. 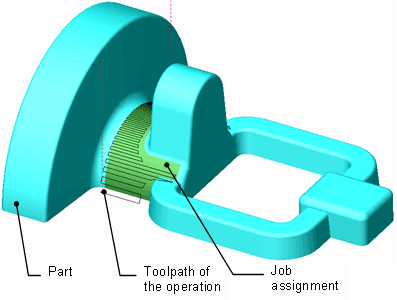 The order the items are listed in the job assignment does not influence the toolpath will be generated. 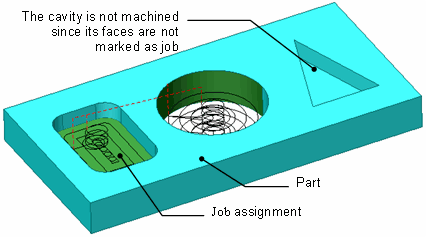 The job assignment also defines the automatic machining levels. For example, if a wall of a hole is specified in the job assignment then the lowest level to machine will be determined by the lowest point of that surface.